Dogs are such welcoming beings. They do what comes naturally - freely and openly. They are always ready to discover what the day has in store. My name is Carolyn, I moved to San Francisco quite a number of years ago from Victoria, BC, Canada. I like the openness and the interesting creative juices that flow in this great west coast city and so I decided to make it my home. I live in a beach house near the ocean in the Sunset District with my guy Zack and my two Chihuahua mix dogs named Ben and Neche. I enjoy living in the area that I do partly because it supplies such great outdoor terrain for dog and human exploration. When I was young I was a member of 4-H and volunteered as a veterinary assistant after school - animals have always been so important to me. 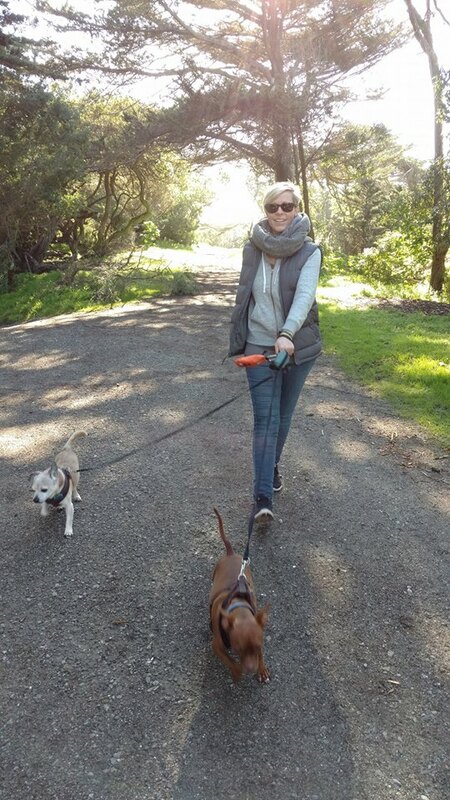 In San Francisco my volunteering has included socializing and walking dogs at the SFSPCA, upkeep/makeover grooming of dogs at San Francisco Animal Care & Control, as well as assistance with the adoption of dogs with Rocket Dog Rescue. I decided to use the dog knowledge that I have to create Little Woof Pack. I am a licensed and legally permitted to do the work that I do with the City of San Francisco. I am professionally trained and certified by Dogbiz as a dog walker. I am trained and certified by Pet Tech in Pet First Aid & CPR. I am insured by Mourer Foster. You can count on me. I think dogs are the most amazing creatures; they give unconditional love. For me, they are the role model for being alive. Dogs need regular exercise and socialization and they need to have their brains stimulated. If they are not given an outlet to do so there will be clear signs and there will usually be problem behaviors present. Have you noticed or heard of any of these behaviors in dogs? Destructive actions like chewing up clothing or gnawing on household items, or pulling the garbage apart. Acting out of turn, snapping, being too rough, having too much energy, acting chaotically, behaving like Tarzan. Needing attention but then not listening to your words when it is required. Excessive barking or crying or licking of parts of the body or chewing at their tails or nails. Often these are signs that dogs need an outlet to let off some steam - to use their energy and work their minds, to see new things, enjoy fresh air and exercise. Dogs who are provided with the means to exercise and socialize are going to be calmer more relaxed beings. They will be the furry individuals their humans want to be around. I believe that it is of great importance to give dogs the opportunity to be the healthy happy pets they can be. To be rewarded for good behavior, to eat good food, to be safe, to be loved back as much as they love. If you would like to supply your dog with more outdoor activity than your time or abilities will allow for - I can help.